Paperback, 224 pages, 13.5 x 20.6 cm, 5.3 x 8.1 in. It is so easy to be healthy: to truly relax, to move and exercise happily and regularly, to eat healthy and with gusto – and to understand how the heart works and what it needs to beat strongly and for many years. Bestselling author Dr. med. 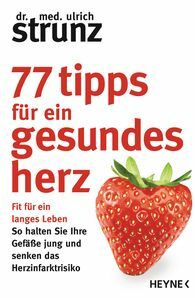 Ulrich Strunz has developed a wonderfully obvious and easy heart health program with which anyone can minimise and sustainably reduce the risk factors for cardiovascular diseases. Clear, understandable, effective.